My first instinct when watching a one-woman show is to be wary. The thought reminds me of awkward platitudes with low production values and Maureen Johnson from “Rent: The Musical”. However, Anu Yadav’s performance in “Meena’s Dream” was powerful enough to overcome those first reservations. Yadav is one of the first performers to truly convince me that acting is her life’s purpose. Yadav’s “Meena’s Dream” is about a young Indian- American girl whose mother is sick and struggling for money. To reconcile her anxiety about her mother’s illness, Meena has fantastical adventures in her dreams, guided by the Hindu lord Krishna. Yadav plays all the characters including Meena, her mother, Krishna and other supporting characters. One distinct characteristic I noticed in Yadav’s writing and performance is that her children seem like actual children rather than what an adult believes children are like. Meena is precocious, smart and bright while still having the rough edges of a child. At times she can be a tad annoying, bothering her mother to tell her a story. Yadav’s Meena understands the circumstances around her mother’s illness and their relative poverty but doesn’t understand the exact circumstances and reasons behind it. Part of Yadav’s story is Meena trying to fight off the knight of anxiety, truth-telling trees with money for leaves, and a worry machine that drains the color out of landscapes. These are clearly metaphors for growing up and acknowledging the realities of the world around her. 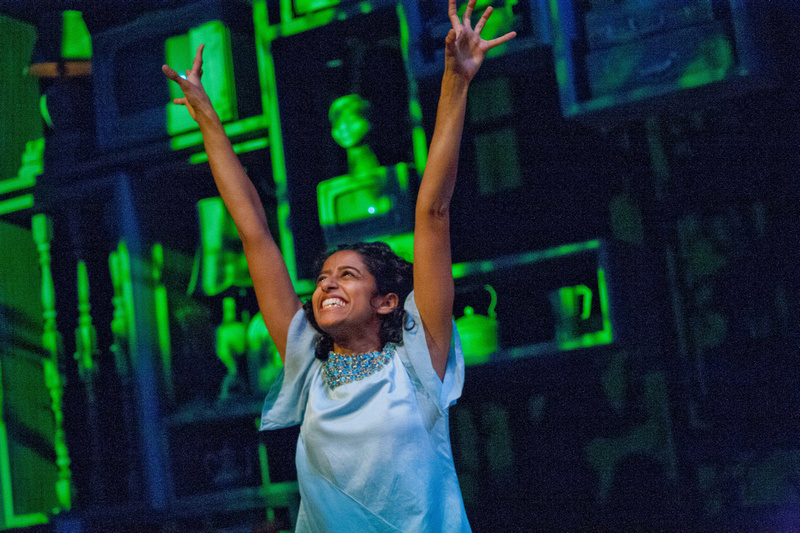 Yadav’s Meena and Krishna spend much of the show fighting off these demons, in part so that Meena can keep her bouncy attitude and childlike wonder. I spent much of the play conflicted about this scene of the show. I wanted to keep Meena innocent but that meant that she was partially ignorant of the stress around her. I kept asking if it was better for Meena to keep her innocence or to mature and try to handle the conflict in her life as an adult. I think Yadav’s argument to keep childlike innocence works better because Meena is nine years old. Because she is so young, it’s worth it to keep her dreams and innocence for a few more years. Had she been a teenager, the play would not have worked half as well. Meena’s Indian heritage is a significant aspect of the character. Her mother speaks with an Indian accent. Yadav’s Indian accent was so well done that I had déjà vu of conversations with my aunt every time Meena’s mother spoke. Meena’s mother intermixes Hindi and English in her conversation and sings bedtime songs in Hindi. Meena’s bedtime stories include myths from Hinduism, and her imaginary friend is the Hindu deity Krishna. Yadav doesn’t stop to explicitly translate any Hindi or explain Hindu philosophy. A lot of Hinduism has been co- opted by California yoga instructors who love to talk about their secret mantras. However, Yadav’s Hinduism keeps Hindu spirituality true to those who actually practice it. More importantly, she treats it lightly, the way a nine-year- old would. A big part of Hindu spirituality is that God is everywhere, constantly surrounding us. Meena takes this thought and interprets it as Krishna being a pen, a lamp and a toilet bowl. This felt especially true to my experience when I would ask my mother if Krishna was the table, the book or that tree over there. I think most importantly, “Meena’s Dream” is entertaining and engaging. A lot of the time in theater productions, especially one-person shows, the performer is not compelling enough to keep the audience’s attention for an hour, especially considering the lack of ornamentation. There are very few set pieces, musical or lighting cues to distract you. There is only the energy and dynamic of the performer. Yadav’s energy remained high the entire time and her script did a great job painting the set in the audience’s imagination. Although the set was a bedroom with just a bed and desk, when Yadav described a schoolyard or a pharmacy, I was there. More impressively, when she took us through Meena’s dreamland, I could see the same fantastical places Meena was dreaming about. Anyone who has sat through a friend telling them about a dream can know how boring and tiresome that can be. However, Yadav’s descriptive script and acting kept me emotionally involved in the story at hand.